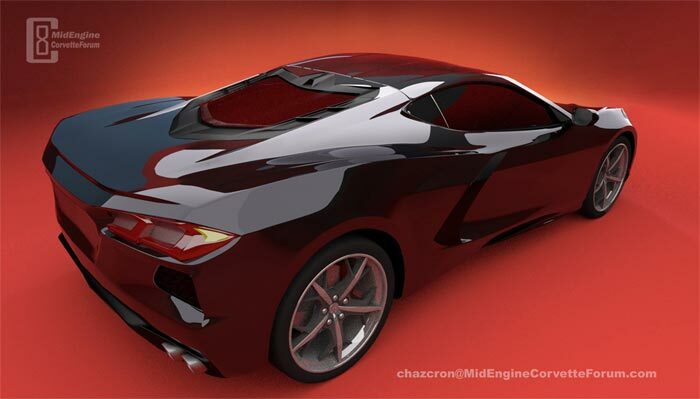 Chazcron is one of the digital artists who have helped Corvette enthusiasts fill the void between various sightings of the C8 mid-engine Corvette by creating a series of high-quality renders and 360-degree videos based on the spy photos. We’ve contributed to his project by sharing some of the highest-resolution C8 spy photos that we had access to and it appears that the ability for him to zoom in on certain features and design cues is paying off based on this latest post from the MidEngineCorvetteForum.com. 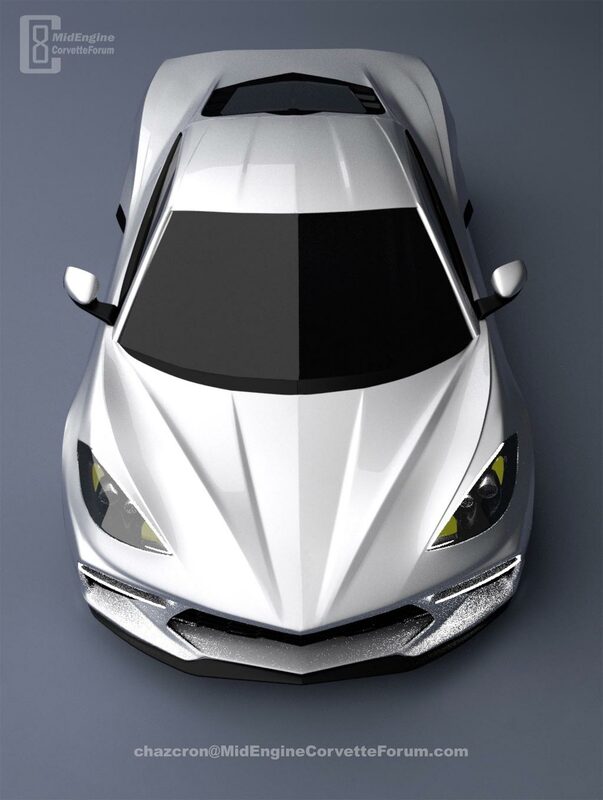 Thanks again to Chazcron for sharing his work with us over the last few months as his renders have helped us to “mentally transition” (thanks John for that phrase) to what the C8 may look like when finally revealed. In this latest post, Chazcron shares several gifs and new renders of the C8 and provides quite a bit of commentary as to why, how, and what’s next. I’m doing another round of checking proportions against hi-res spy photos (thank you Keith and John) I made the rear window 20% longer. Again, no panel lines added in post (it’s late) and very little touch-up. Love them, hate them, or just agonize about the things I am supposed to be aware of and refuse to address. (ok, I admit, the chrome window surround was an accident, but I thought it was a little classy at first) You could even… gasp… marvel at the things I most likely got right. Again, I’ll change my scoop headlights and taillights when someone posts a decent leak. I’m probably going to model the huge wipers and may try to actually carve the hood and door creases like I did with the top of the rear deck. (the only modeled panel line I’ve cut so far) Since it is mostly finished, I will probably render test pix and post them more often, as you might have noticed. My first thought was, the leading edge is fake cardboard to throw us off (evidenced in my first renders.) Then I saw the image with the door open and the drop down winglet right where the leading edge was. If the leading edge was fake, the remaining top of scoop on the body would be too almost too small for a door handle and most certainly not hidden. Also, if fake, you’d have a hard and awkward time reaching the real door handle. That’s how I came to the conclusion it is real. I assume it would be prohibitively expensive to stamp the shape as one piece. Ferrari can afford to do that, GM can not. 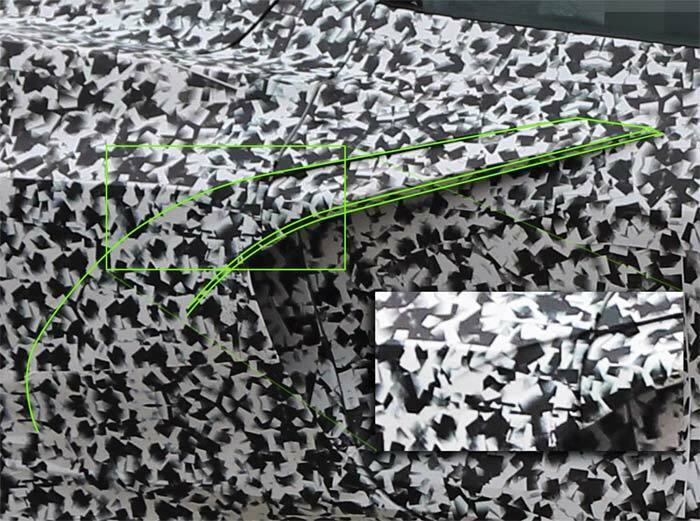 Some of the hi-res photos showed the seams running under the camo, giving me a pretty good estimate of where it “leads” to. I extrapolated using the idea that shapes repeat. Why do I have it further back from the door edge? Two things, one, if it is where it shows now, directly beginning at the door edge, I’d think there’d be a good chance of finger pinch. Two, the spy photos show the fake extension wobbling in both directions, in and out. Why black and not body color? I think the lower end models could be body colored. But ask yourself, why make a distinctly different shape and make it body color? The upper-end models would naturally lend themselves to carbon fiber. Further, the rear window surround will likely be black, not body color, to make the tiny rear window appear bigger, the exhaust fairing is black as is the front grille is likely to be. It just makes sense to me to have a dash of black along the side too. Is my shape right? Most likely not. But it satisfies my design sense. I trust that the GM designers have a far better eye than me. That especially goes for my trainwreck of my inner headlight design. Nice in white with actual color bouncing around. Unfortunately, I didn’t give my light bars enough sampling to illuminate the surroundings without extreme pixelation. I’ve spent a lot of time spinning this car around in 3D, probably more than anyone outside of GM. Once you get the ingrained image of the long-hooded traditional Corvette out of your head, I truly feel its design honors the look and feel of the storied Corvette heritage. It is a worthy successor and an outstanding addition to the Corvette line. My model and renders will pale in comparison to seeing it in the flesh. They always do. Thanks again Chazcron for the photos and your insight into the design of the C8! As always, we seek our readers comments below to add to the conversation. 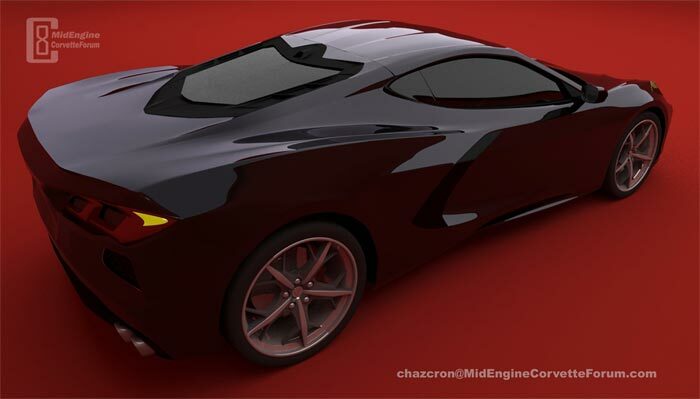 You can also head over to the MidEngineCorvetteForum.com and discuss the latest renders with the nice and knowledgeable group of the Corvette enthusiasts who would welcome your participation. I think Chazcron needs a job with GM design. His observations are top notch and they would benefit…. Congrats to Chazcron for his many and long hours invested in his renderings for our viewing. I think David is correct, maybe Chaz is putting together his design portfolio. I may be spending too much time checking out his renderings, albeit I see, more and more, a smaller, down size version of the 2019 Camaro. Scroll halfway down this Web site to see what I mean, under the heading ZL1: Any challengers? Or maybe, like I wrote, it is just me. Ditch the hood strakes – looks contrived and oh so fakey. Rear window way too small…keep trying. Great work from Chazcron, we do need those tail and headlight details to really put it together. I love the renders from Chazcron. Each iteration moves closer to what I believe the final design will look like. Just curious as to why Chazcron does not include the spy photo spoiler on his renders? @Chuck+1. 7 very obvious hood creases? Way too busy in reference to a clean design for the rest of the car! GM better make blind spot detection cameras standard with that minuscule rear window. 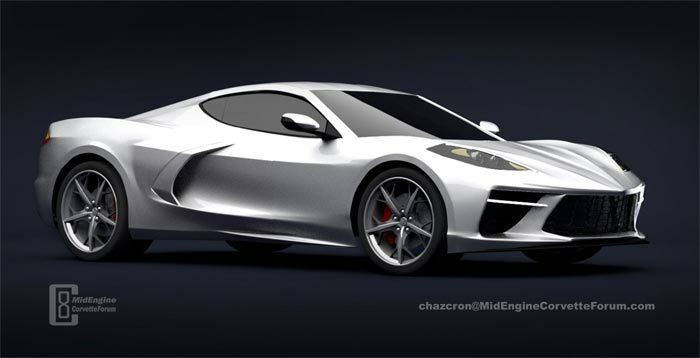 I think the 3/4 side window and hood is all wrong …team corvette has fooled most artist up to this point. It just doesn’t look good from these last renderings. Losing my enthusiasm at this point. [RUMOR] C8 Mid-Engine Corvette To Start Production in December?